But, fear not, someplace out there on the web there are hoaxsters and pranksters of all stripes, and someplace, somewhere some folks will get gotten either because they weren’t wary, or if the gag is good enough, despite it. Despite being punked twice last year by April Fool’s gags, and despite even doing that editorial mea culpa on the subject, the New York Times seems to have been snared again. That’s what they get for putting up a paywall. Scott Greenfield of Simple Justice fame has the link. In an editorial today regarding the BP oil spill in the Gulf, the New York Times decided to take potshots at lawyers and assume that they would breach their ethics. In doing so, they elected to act like the New York Post by simply ignoring history and accepting one long running newspaper meme: No one ever lost a nickel by bashing lawyers, because when we defend ourselves we sound like, well, lawyers. The context of today’s assult is the $20B in funds offered up by BP to settle Gulf claims, and management of the fund by Ken Feinberg. Feinberg has quite the recent portfolio, managing this fund, being the “pay czar” for companies that were bailed out by the government during the recession (from which he stepped down to become engaged here), and also managing distribution of an extraordinary $700M+ funds related to settlement of claims related to 10,000 responders to the September 11 attack. Given his reputation, experience, and the amount of money on the table, it is clearly in the interests of every victim of this spill to give this program a careful, unemotional look. We probably cannot expect the lawyers to act responsibly. The Times‘ justification for this assault is the presumption that, if one is going to go through the BP fund, then one doesn’t need a lawyer. In so claiming, the Times displays either its utter ignorance of proving the elements of an economic loss, or it elects to turn a blind eye. Because all claims are not equal. Some are difficult and need experts. The shrimper with the W2 is one thing, and the new business owner who was making investments in the business at the time BP recklessly wrecked Gulf waters is something else. Proving that future loss won’t be easy. And it isn’t just shrimpers and beach resort businesses that are hurt, because as they go down, so too do the brick layers and bread makers that depend on those people. An entire economy suffers, and proving the relationship to the oil spill won’t be simple for many. There will be a billion shades of gray for the manner in which people were affected by the spill. Does the Times seems to suggest that Feinberg will simply pay claims without the expert analysis that’s needed in the evaluations? Will the claims simply leap off the table and magically prove themselves to Feinberg without effort? In one sense, this is like a trial on damages only, with liability already established. But you still must prove those damages to the finder of fact. Perhaps many of the claims are simple. Most assuredly, many are not. Only a fool would walk into the forum unarmed. The outrageousness of the Times‘ lawyer bashing is brought home with the irony of Feinberg’s involvement. For he also oversaw the September 11 Victim Compensation Fund and has been, to nearly universal acclaim, an outstanding public servant. And that 9/11 Fund saw over 1,000 lawyers working as part of Trial Lawyers Care, representing most of those directly injured in the attack and the families of those killed. Those lawyers did so on a pro bono basis. It was then, and remains today, the largest distribution of free legal services in the country, and I was a proud (albeit small) part of it. Nobody knows better than Feinberg about the extraordinary efforts put forth by the legal profession. And yet, the Times merely assumes that, despite history to the contrary, lawyers will act unethically by giving advice that is contrary to the interests of their clients. I expect such crap from the Post, not the Times. Perhaps the usual editorial writers were away this week on vacation, and they left the interns in charge. For the piece surely wasn’t written by anyone with a lick of common sense. Goodman, who said he knows he should have checked it out, especially on April Fool’s Day, said that because several prominent legal blogs also had the item, he gave it more credibility than he should have. What he did not know was that the other bloggers were in on the hoax. Corbett said the episode pointed up the risks of news aggregation and the need to rely on trustworthy sources. But we weren’t the only ones to get them. They explain another episode also. But the political bloggers, to their collective credit, didn’t bite, despite wide dissemination of the story. Not on the right or the left. Instead it was the vaunted New York Times that ran with the story without bothering to check its facts. The Times, of course, had no sense of humor about it when the angry phone call came to me a couple of hours later. Here’s how it played out: Knowing that the premise of me getting such a gig was, shall we say, a tad far-fetched, I enlisted some heavy-duty muscle to give it credibility. Without others watching my back, I knew the ruse wouldn’t get off the ground. I post at 6 a.m. with an understated announcement. At 9 am Above the Law uses its megaphone by putting it in the Morning Docket. Those that come to read my post will likely think it’s an April Fool’s gag. Patrick @ Popehat (who last year pranked the world by creating the North Korean Twitter Feed) follows at 9:30 with a rip-snorting, barn-burning denunciation of my appointment, filled with speculation and innuendo trying to feed red meat to the political right. It would be a parody of a political attack, if it were still possible to parody such attacks anymore. (see: I Guess John Edwards Wasn’t Available) Patrick also has a source inside the Senate Judiciary Committee to give the appointment credence, albeit an anonymous one. Scott Greenfield @ Simple Justice pitches in on petty political problems within the office of the White House Press Secretary. Those problems arise since I won’t be answerable to this department, but only to the White House Counsel. The Press Secretary is mad about that. (see: Turkewitz: Honest Broker or Loose Cannon?) Now, if the WH denies the story, I have a good reason. His source inside the press office was anonymous. And Orin Kerr @ The Volokh Conspiracy comes in to say that his source inside the White House counsel’s office is also pissed. (see: How Did the White House Pick Its Law Blogger?) This source is mad because I posted before it was official. I’m a loose cannon. And yes, his source is anonymous. So, I have the ATL megaphone followed by three reputable bloggers confirming my appointment with three anonymous sources on a day everyone is looking out for pranks. Would anyone be taken? And Walter Olson @ Overlawyered was on tap to likewise pan my selection, if he was able to get to a computer (he Twittered it). Now let’s ask again: Would anyone be taken by this motley consortium of co-conspirators? Silly question. Of course someone would. Who needs bona fide confirmations in the digital age when speed is more important that accuracy? Everyone wants to beat everyone else to the headline. And the illogic of someone setting himself up for a digital thrashing provided cover for the preposterous nature of the whole endeavor. While I may have certain skills as a trial lawyer, none of them prepare me for a position in the office of the White House counsel expounding on constitutional law issues I haven’t dealt with before. The comments came in via email and blog comments, on Facebook and on Twitter. I felt bad for my friends that were taken in. But only a little bit. My friends know how to laugh. And so do my digital friend co-conspirators. But the political blogosphere, as I mentioned earlier, never bit. Perhaps one reason (aside from it being a silly endeavor), is people love to expose a ruse, making it more difficult to pull off on such a high-profile day. Even before I made it to the office, the ABA Journal had very strongly hinted at a stunt. Their post is time-stamped 6:46 AM CDT. Ouch. They even gave a run-down of my a prior April Fools hoax I ran regarding fantasy baseball and judicial recusals. It was almost like they were waiting for me. …After all, as Mr. Turkewitz, a Manhattan lawyer, writes on his New York Personal Injury Law Blog, he is about to be sounding off on all manner of legal issues as the Obama administration’s new White House law blogger. At 4:45, I received a phone call from an infuriated “Andy Newman” from the New York Times demanding to know if this was an April Fool’s joke. Unlike the classy Ashby Jones, Newman had zero sense of humor and demanded that I answer “as an officer of the court” or he would pull the post down. I tried not to laugh, and told him that due to concerns in the White House about me jumping the gun on the story (as per Orin Kerr’s post @ Volokh), I really shouldn’t say anything and would clear it up tomorrow. This clearly wasn’t good enough for him as he hung up on me, and down came the NYT post. The Times, I guess, doesn’t like being punked on April Fool’s Day. Next time, perhaps, they will fact check April 1st stories involving small-time law bloggers suddenly becoming White House law bloggers. Next time. As of 6:30 a.m. on April 2nd, the new comment about a a “pending callback from the White House” is still up, so maybe The Times is losing its muscle in the White House. Hopefully, my new best buddies in Washington weren’t too upset about getting the press inquiries. So where did the idea come from? It came from my screenwriting brother Dan, who has no shortage of story ideas, and who was recently in the news because of the letter Justice Scalia wrote him regarding secession. 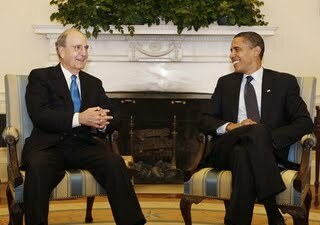 He was also the one that stuck my head on the body of former Senator George Mitchell for my photo op with President Obama (compare to picture at top). Incredibly, one commenter at the Volokh Conspiracy actually knew this was a picture of Mitchell. How? There must be a million photo op pictures like this. Which leads me to believe that Sen. Mitchell himself or his wife/kids/friends/staff must be reading and commenting. (The same comment was left on my site, which I declined to publish so the gag wasn’t too quickly exposed.) So let me give a big shout-out to the Mitchell family, and thank them for tolerating my comments about George’s posture. My wife, by the way, hated the head shot that was photoshopped on to Mitchell’s body, since she said it made me look 20 years older than I am. So for Mrs. NYPILB (she loves that acronym), I’m putting up another that was taken the same day. Now one final question: Why the hell would I go to all this trouble for an April Fool’s stunt? I’m glad you asked: Lawyers often deal with misery. 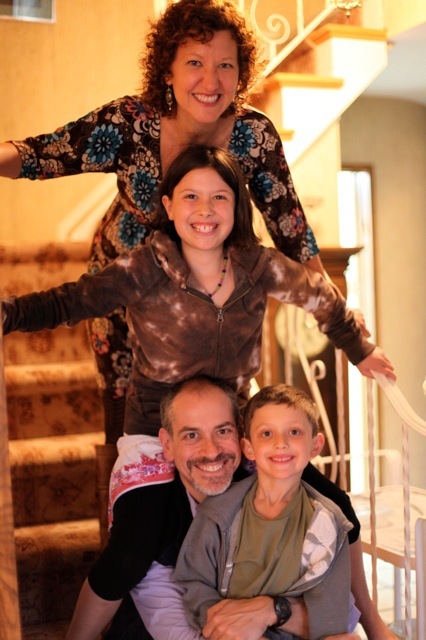 Peoples’ lives can be forever changed in a fraction of a second in an accident. Divorce. Child custody. Bankruptcy. Arrests. 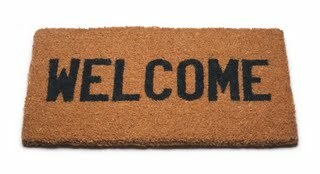 There is no real end to the chain of human misery that clients bring to the doors of practicing attorneys. So the April Fool’s post is a count-your-blessings kind of thing. You only live once and life doesn’t come with rehearsals. If you can enjoy yourself a little without hurting someone else, then that’s OK. Laughter isn’t the antidote to all of life’s ills, but it sure doesn’t hurt. Unless, of course, you’re the Paper of Record. Numerous additional links to the gag are at this welcome post for new readers.